A relaxed and friendly town located on the Gold Coast, Broadbeach, or “Broadie” as the locals call it, is a vibrant and exciting city with something for everyone. From the gorgeous sweeping beaches to an endless array of bars, eateries, and cafes, you can rest assured there is plenty of things to do in Broadbeach. You can also spend a day exploring nearby Surfers Paradise, which is a short 10-minute drive north. 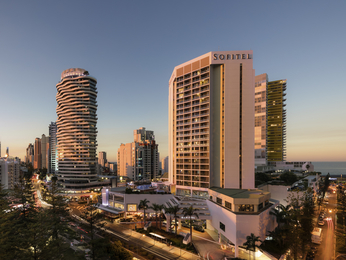 The best part about our Broadbeach accommodation is that it is located right next to the city centre and all the major theme parks are less then 30 minutes away. The Star Gold Coast plays host to a huge range of entertainment, and Pacific Fair Shopping Centre provides the perfect outlet for some retail therapy. Families and foodies alike will appreciate Broadbeach Art and Craft Markets that happens on the first and third Sunday of every month, all year round. If you hear the water beckoning, learn to surf at Broadbeach Surf School or for the experienced, carve up the many surf breaks along the endless coastline. You will feel welcome in one of our Broadbeach hotels minutes from the Gold Coast. Enjoy the relaxed vibe and book a hotel in Broadbeach for a weekend escape, family getaway or business trip. You will be sure to find Broadbeach accommodation perfectly suited for you and conveniently located to the best the Gold Coast has to offer.